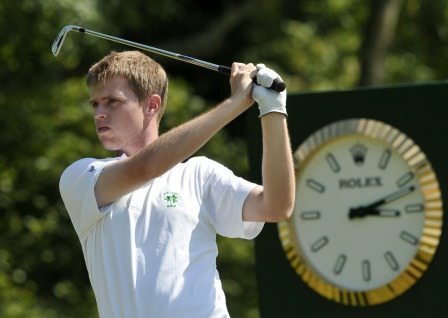 NUIM’s Gary Hurley will make his Palmer Cup debut in June. Waterford natives Gary Hurley (NUI Maynooth) and Kevin Phelan (North Florida) have been named in the European Palmer Cup team for the annual Ryder Cup-style clash with the USA at Wilmington Country Club in Delaware from June 7-9. For the Americans, California’s Michael Kim led the six U.S. players selected by the Palmer Cup Ranking. He was joined by North Florida’s Sean Dale, Patrick Rodgers of Stanford, New Mexico’s James Erkenbeck, Alabama’s Cory Whitsett and Cal’s Michael Weaver off the ranking. Committee selections were Daniel Berger of Florida State, Abilene Christian’s Alex Carpenter and Alabama’s Justin Thomas. Bobby Wyatt of Alabama was coach Jay Seawell’s coach’s pick. On the European side, Julien Brun of TCU (France), Iowa State’s Scott Fernandez (Spain), Pedro Figueiredo (Portugal) and Pontus Widegren (Sweden) of UCLA, UCF’s Greg Eason (England) and California’s Joel Stalter (France) were the six selected from the Palmer Cup Ranking. Graeme McDowell with the winning USA side at Royal Portrush in 2010. Waterford native Phelan and Nova Southeastern’s Ben Taylor (England) were committee selections while Hurley qualified for Team Europe by winning The R&A Foundation Scholars’ Tournament. Arkansas’ Sebastian Cappelen was coach Andrew Coltart’s coach’s pick. Carpenter, Rodgers and Thomas have each previously represented the United States in the Palmer Cup. Widegren will become just the fourth golfer to play in four Palmer Cups while European teammates Cappelen and Brun are competing in their third and second, respectively. Figueiredo is the first player from Portugal to play in the event while Dale, Phelan, Eason and Fernandez were the first golfers from their schools selected. Europe won the 2012 Palmer Cup at Royal County Down, 13½ – 10½, by winning seven of eight singles matches on the final day. California, Sophomore, Del Mar, Calif.
North Florida, Senior. Jacksonville, Fla.
Abilene Christian, Senior. Little Rock, Ark. Kevin Phelan in action in last year’s European Individual Amateur Open at Carton House. Pciture by Pat CashmanWaterford Castle’s Kevin Phelan has one big ambition this year — to play Walker Cup. Gavin Moynihan has been called up for Walker Cup duty. Picture: Thos Caffrey / www.golffile.ieWaterford Castle’s Kevin Phelan and The Island’s Gavin Moynihan have been selected to represent Great Britain and Ireland against the United States in the Walker Cup matches at the National Golf Links of America in Southampton, New York from September 7-8. Gavin Moynihan (GB&I) watches his tee shot on the sixth hole during the foursomes match at the 2013 Walker Cup at National Golf Links of America in Southampton, N.Y. on Saturday, Sept. 7, 2013. (Copyright USGA/Chris Keane)Skipper Nigel Edwards will be relying on Ireland’s Kevin Phelan and Gavin Moynihan to put a sting in Great Britian and Ireland ’ tail as they attempt to battle back from 8-4 down in the Walker Cup in New York. Gavin Moynihan (GB&I) shakes hands with Patrick Rodgers (USA) after their match during the foursomes match at the 2013 Walker Cup at National Golf Links of America in Southampton, N.Y. on Sunday, Sept. 8, 2013. (Copyright USGA/Chris Keane)Kevin Phelan said goodbye to the amateur ranks with two wins on the final day but the United States of America still defeated Great Britain and Ireland, 17-9 to win the 44th Walker Cup Match at the National Golf Links of America.